The spring Islamic sales are being held in Bond Street and elsewhere in London this week. These graphic, almost sensuous silk velvets and brocades, rediscovered by the beau monde in the early 1900s, are tipped to break records at Sotheby’s on April 26 and are just some of the exceptional Ottoman and Turquerie wares on show. Christie’s King Street and South Kensington, Bonhams and even less well known Rosebery's are also all worth exploring. Islamic Sales Week also attracts like-minded events. One such is the 25th Levantine Heritage Foundation dinner in Knightsbridge on Monday 24th, where Haydn Williams, author of Turquerie: An Eighteenth-Century European Fantasy, is guest speaker. The historian Philip Mansel is a leading light in this excellent society, which pools an incredible archive of memoirs and memories of the Ottoman Empire and makes them freely available online. The sales are an unmissable chance to get close to (even touch) untouchable treasures such as this shimmering voided velvet çatma, embroidered with gold and silver thread, which changes colour and hue as you move round it. It is being sold at Sotheby’s on the 26th and will almost certainly end up, if not in a safe, in well-guarded, well-intended, low-lit museum vitrine. 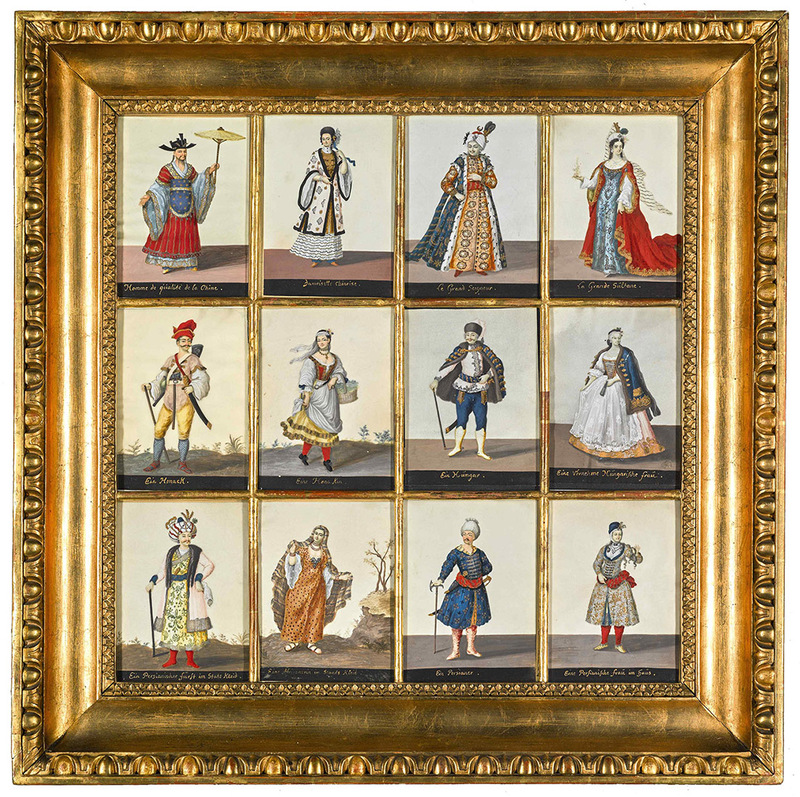 We start our whirlwind tour at Sotheby’s, where Le Grand Seigner is one of a dozen early-18th-century costume miniatures set in a charming gilded frame (Sotheby’s Arts of the Islamic World, April 26, lot 138, est £60,000–80,00). They belong to the Cesky Krumlov castle series of costume portraits, assembled by the cultured Princess Maria Ernestine von Eggenberg and her heir and nephew Prince Adam Franz von Schwarzenberg in the early 18th century. An inventory at the time of the prince’s death in 1733 mentions 93 of these portraits, all in painted black frames (visible below each portrait). If they are delightfully theatrical, it is not surprising. The princess built a theatre at Cesky Krumlov, and her court was famous for its richly costumed entertainments. 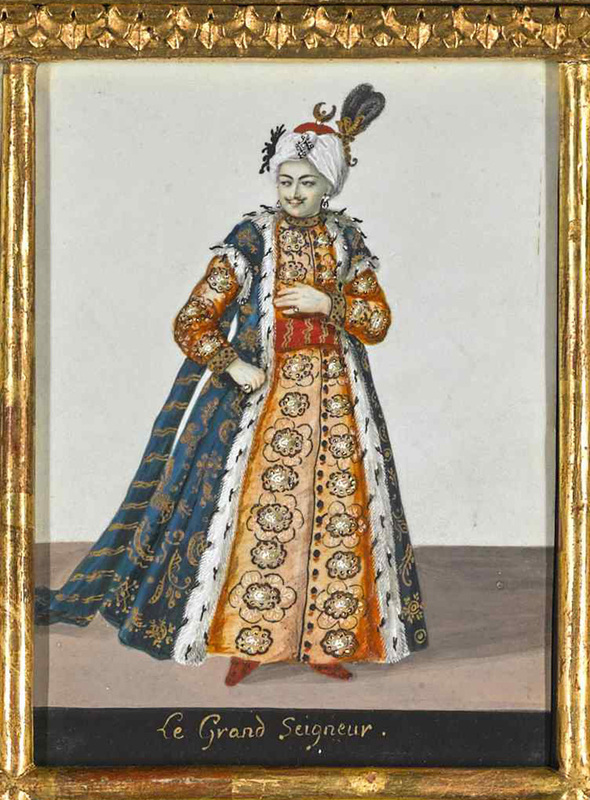 Exquisitely executed on vellum in gouache, heightened with silver and gold paint, Le Grand Seigneur and La Grande Sultane (top right) are based on the engravings of Nicolas Bonnart (c1638–1715), and recall the theatrical vogue for all things Ottoman at the court of August the Bold, Elector of Saxony in neighbouring Dresden. August had a taste for the camp in a quite literal sense: he owned a city of Ottoman tents (1,051 at one count) as well as a regiment of Saxon Janissaries, and received important guests dressed up as Süleyman the Magnificent. The ‘Türckische Cammer’ in Dresden has one of the world's great collections of Ottoman arms. Charming though the costume paintings are, it is the Ottoman textiles that are drawing the big buyers to Sotheby’s this week. 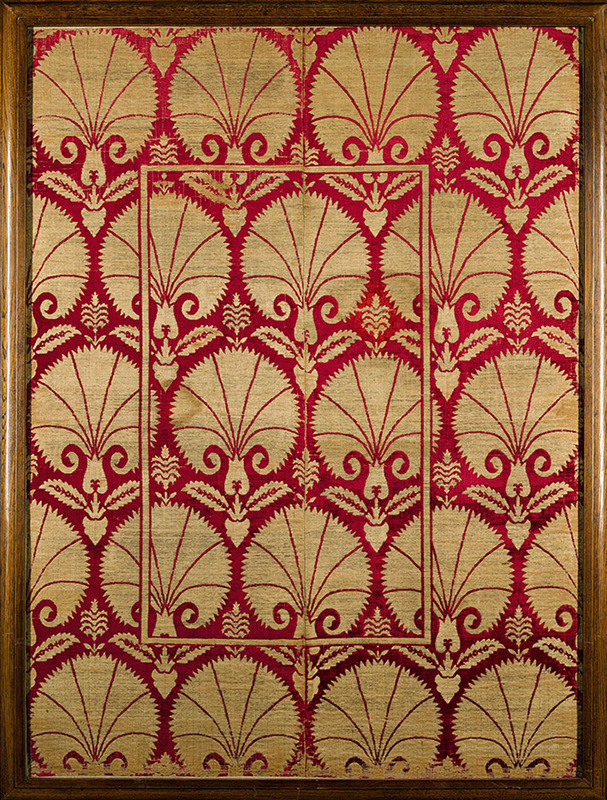 This kemha (brocade) panel (Lot 141, est £30,000–40,000, sold for £236,750) is one of 20 lots from the surviving collection of the grande dame Agine Benaki Salvago, sister of founder of the Benaki Museum, Anthony Benaki. In Philip Mansel’s words Agine was ‘one of the “uncrowned queens of Alexandria”, famous for her taste and her lovers of both sexes, seduced by her purple-blue eyes’. Alexandria at the turn of the 20th century spawned cotton millionaires like nowhere else, in a world vividly evoked and mocked by Laurence Durrell, EM Forster and Cavafy. Agine Benaki’s marriage to Michael Salvago, whose family founded the National Bank of Egypt, sealed a serious business alliance. The two families’ art collections would dominate the Exposition d’Art Musulman, a groundbreaking exhibition in Alexandria organised in 1925. Admiringly covered in the Burlington Magazine it turned out to be Alexandria’s swansong. Two years later, Anthony Benaki left Alexandria for Athens with ‘the lion’s share’ of the family collection, donating it, along with his mansion there, to the Greek state in 1931. 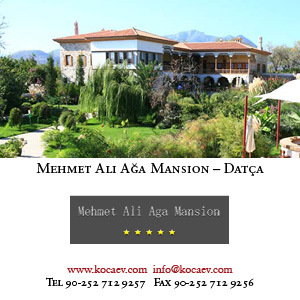 Today the Benaki Museum of Islamic Art is a shrine to connoisseurship. A fascinating photograph of the Salvago Villa in Alexandria (today the Russian Centre for Culture and Science) reveals how the Benakis and Salvagos displayed their exotic texiles – like large abstract paintings. In the Sotheby’s sale they are still in their now dowdy frames. In this photograph the early-17th-century voided silk velvet çatma, with its bold carnation palmettes, above the Iznik plates on the mantelpiece is none other than Lot 140, below (est £40,000–60,000, sold for £416,750). 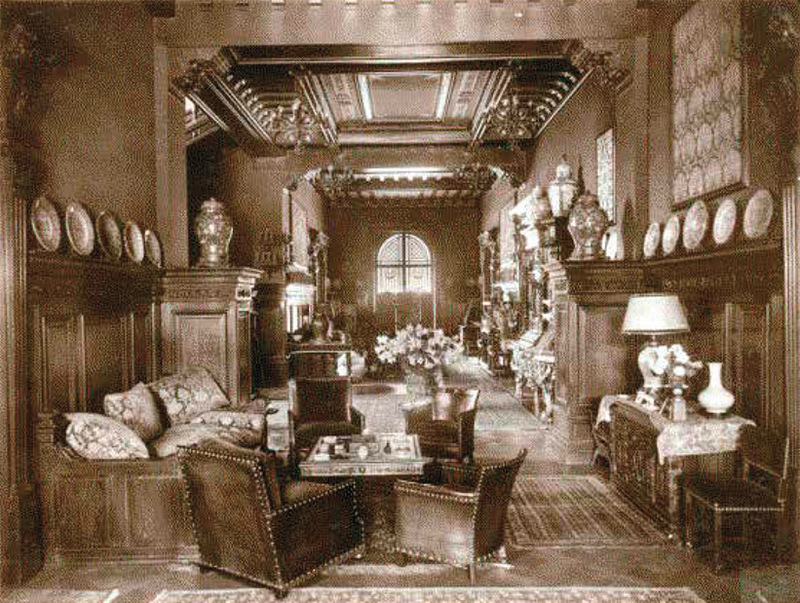 Agine Benaki Salvago bequeathed part of her share of the inheritance to her brother’s museum, including the Persian antique jewellery, but these courtly Ottoman texiles remained in the family apartment in Paris, where they hung in shuttered rooms for much of the 20th century, unseen, unknown, and unfaded. Perhaps even more stunning than Lot 141 is the deep crimson silk ground of this, the most highly valued piece in the group (Lot 139, see detail above). What is so rare is that this çintamani-patterned çatma, complete with its rectangular frame, is not a mere fragment. 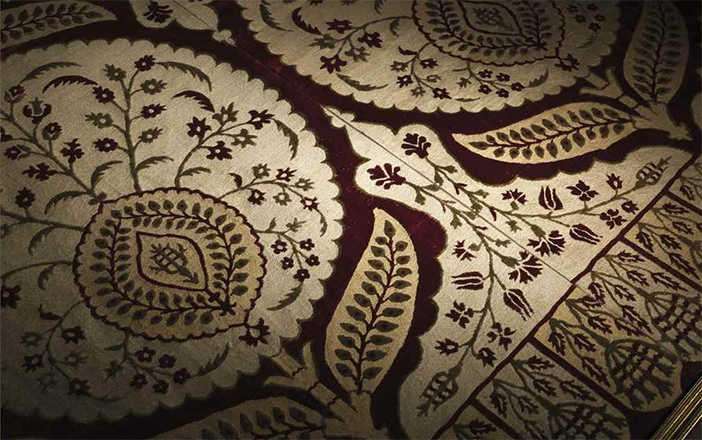 Measuring 162cm by 120cm, and woven in two parts, it is dated to the late 16th or early 17th century. Sotheby’s have given it a conservative estimate of £200,000–300,000 (sold for £1,076,750). 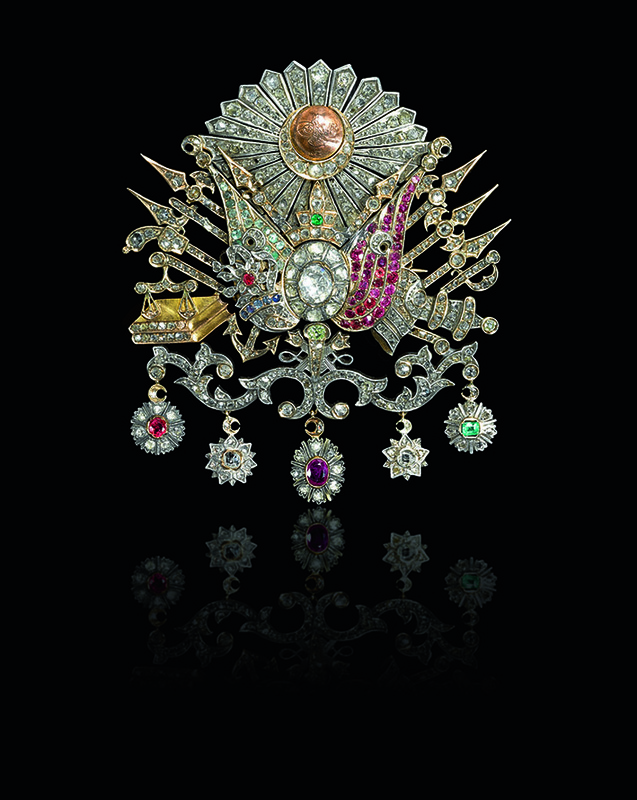 Lot 240 at Sotheby’s, though not from the Benaki-Salvago collection, is very much of the era of the Alexandria cotton millionnaires: an Ottoman brooch, circa 1900, set with gems and the tuğra of Sultan Abdülamid II (est £30,000–40,000). 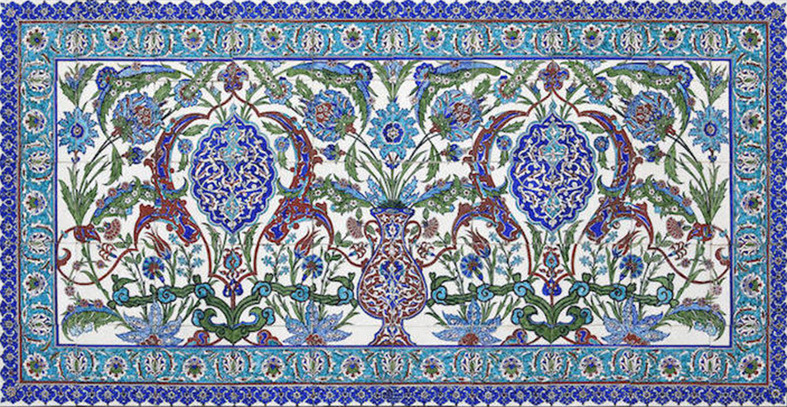 Both Sotheby’s and Christie’s have superb Iznik this spring. 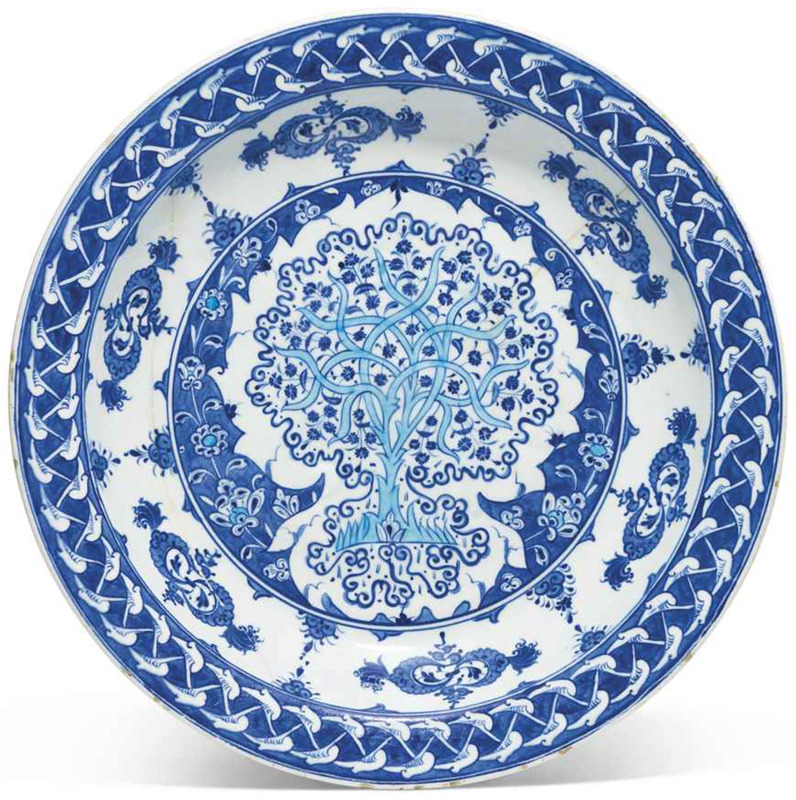 Look out especially for this wild thing, a dish bearing a tree of life, 1525–35, Lot 156 in Christie’s Art of the Islamic and Indian Worlds sale. It comes from the collection of Fernand Adda, another of the Alexandrian cotton millionnaires (est £140,000–180,000, sold for ). 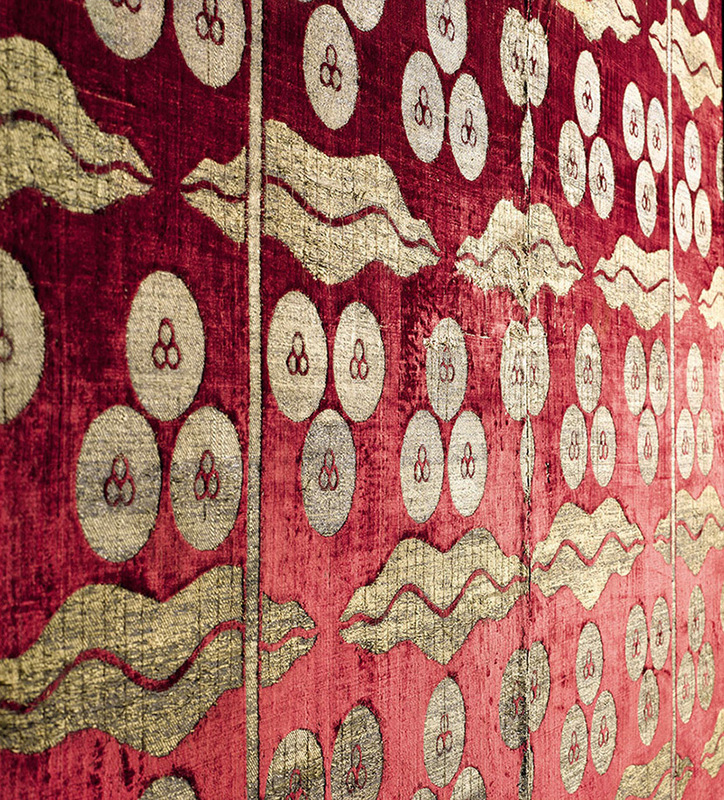 At the upper end of the Christie’s sale, which includes Oriental Rugs and Carpets (among them a particulary fine 16th-centry small medallion Ushak rug), is another handsome silk velvet Ottoman textile, this 17th-century yastık, or cushion cover, with large cusped medallions (Lot 140, est £100,000–150,000). But the Ottomans were not always sitting around on lush velvet textiles. 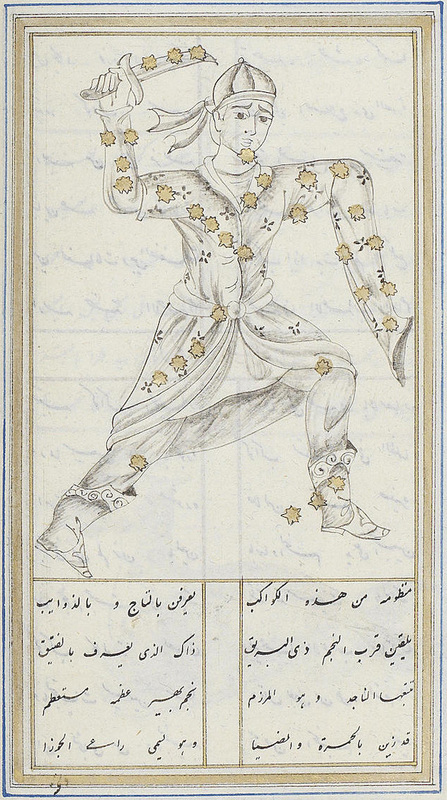 Bonhams kicks off on the 25th with splendid manuscripts, among them a curiosity: this probably Ottoman astronomical treatise written in verse and illustrated with 42 drawings, thought to be late-18th-century or early-19th-century (Lot 61, £5000–7000, sold for £16,250). 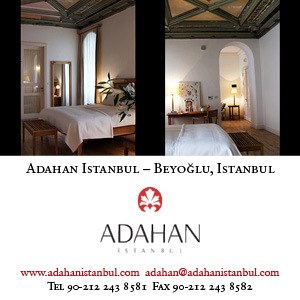 Many people feel slightly uneasy when Iznik tiles appear at auction. Like ivories, you wonder which mosque has had its tiles amputated like elephants’ tusks. To be fair only tiles with decent provenances are accepted by the major auction houses these days. But all the same it is good to see 1950s ‘Iznik’ tiles making an entrance at Bonhams. This is one of a pair of panels by Azim Çini of Kütahya, c1950, Lot 203, very reasonably estimated at £3,000–4,000. 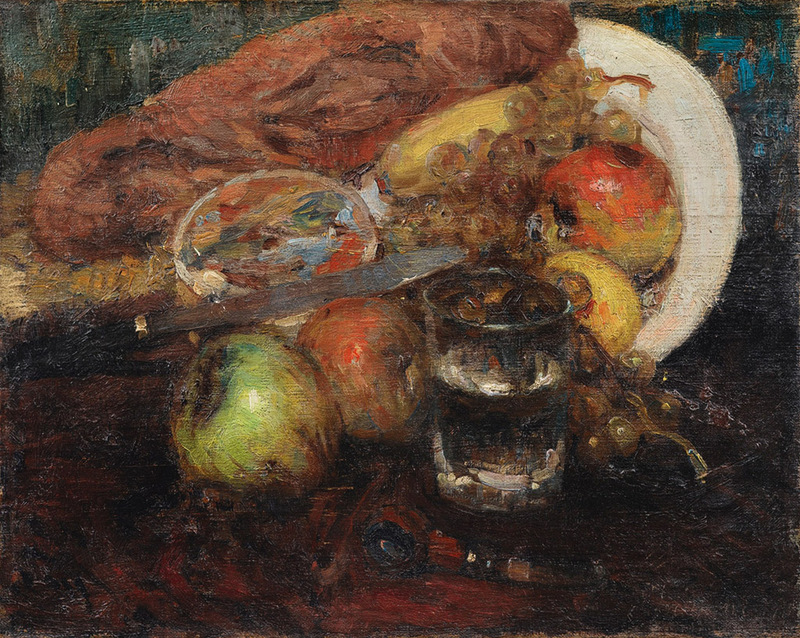 Finally, a far cry from the lush aesthetics of the cotton barons: Turkish artist İbrahim Çallı’s atmospheric Still Life with Apples and Bread – an unexpected pleasure in the Sotheby's Orientalist Sale on the 25th (Lot 39, £15,000–20,000). İbrahim Çallı (from Çal, near Denizli, hence his name) belonged to the talented ‘1914 Generation’ and was a contemporary of Feyhaman Duran, whose career is being celebrated at the SSM this year. The losely knit group earned their colours in Paris before the First World War. This painting, signed and dated 1914, was probably painted there. The name of Çallı’s unlikely master, Fernand Cormon, appears alongside his own on the back of the canvas, though Cormon’s own early Salon style, typified by works such as Murder in the Seraglio, happily failed to rub off on his more robust pupil. 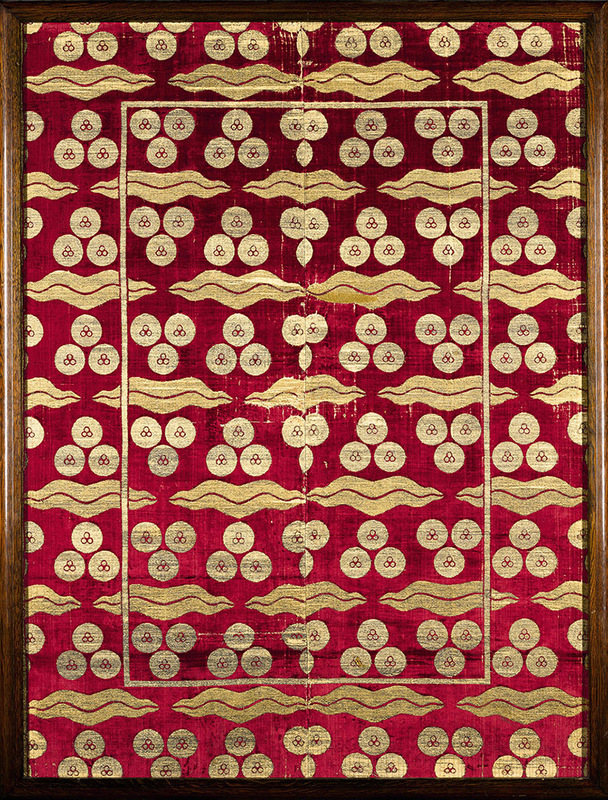 Post-sale footnote: Not all of our highlights found buyers, but Sotheby's Lot 141, the exceptional Ottoman voided silk velvet and metal-thread panel (çatma), with çintamani and tiger-stripe design from the collection of Argine Benaki Salvago sold for £1,076,750, a record price for an Ottoman textile at auction. 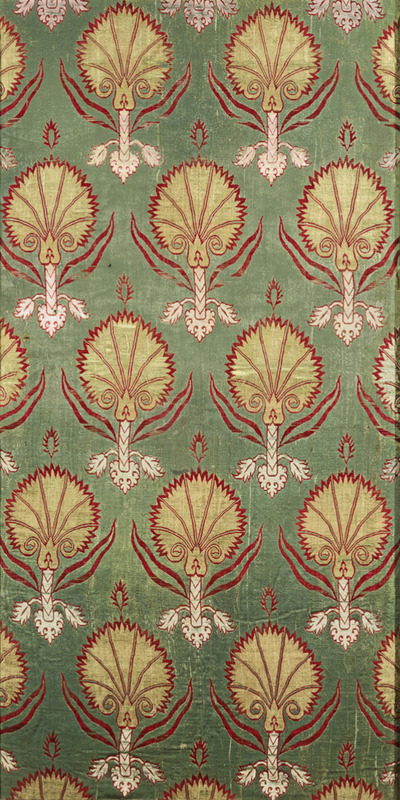 The grande dame's entire collection, comprising eight Ottoman textiles and objects as well as Greek textiles, sold for a total of £2,361,954.